This section contains 4 pages use the Navigation Links at the bottom of the page to navigate. The Mirfield Tank was a Mk IV Female the machine gun equipped variant. On the back of this, six war weary and battle damaged Mk IV tanks were returned from France, these tanks and their selected crews were then tasked by the National War Savings Committee with touring the country to raise moral and more importantly raise much needed funds (more new tanks obviously being on the shopping list) by the way of selling War Bonds and War Saving Certificates. 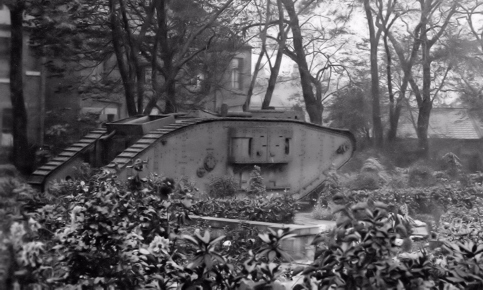 One of the original six "Tank Banks" been displayed.